Graduate teaching assistants, or TAs, are graduate students who teach introductory and intermediate level college courses in universities. TAs develop course materials, lead student discussions or laboratory work, and grade papers and tests for undergraduate, or bachelor’s level, courses. For large classes taught by a faculty member, TAs assist faculty members with materials and equipment during class, and in conducting their research. 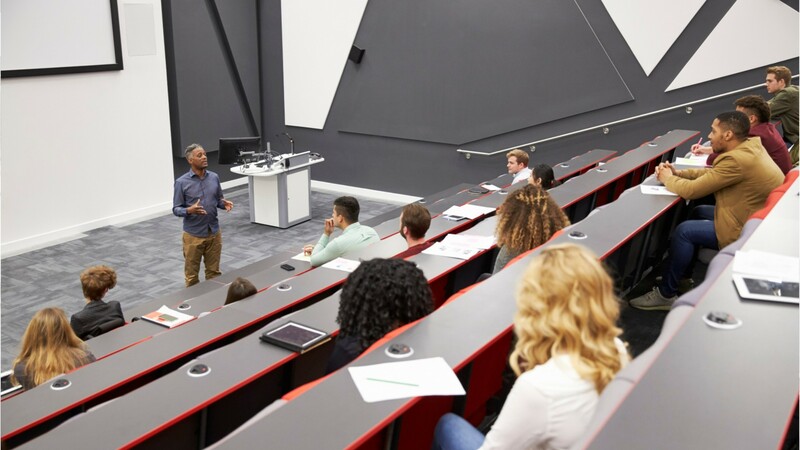 They also provide feedback to students and, for very large classes, act as a bridge between the professor teaching it, and the students enrolled. Graduate teaching assistants hold office hours for answering students’ questions, and offer extra help or tutoring outside of class. Graduate teaching assistants must be enrolled in a graduate school program, and have at least a bachelor’s degree in the field they teach. Typically, they have completed a portion of the coursework required for a doctoral program. See more details at O*NET OnLine about graduate teaching assistants. Graduate Teaching Assistants by U.S. Department of Labor, Employment and Training Administration is licensed under a Creative Commons Attribution 4.0 International License.